You can sign up for a free T Shirt supporting Womans Equality. 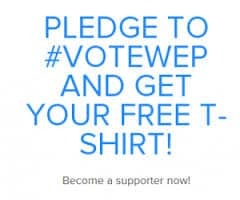 To get your Women’s Lib T Shirt, simply sign the Women’s Equality Pledge and fill out your information. The shirt will be shipped directly to get your home. The Women’s Equality Party’s goal is to bring together the strength and power of our each state’s women leaders. They wish to also promote women’s equality nationwide. I would like to have one of your t-shirts please…. Awesome, Rosanne! If you follow the link in the post, you can sign up for a free t-shirt to support equality for women.